We are still improving this tutorial. In its current state it might be a bit hard to follow. Building a scalable notification system is almost entirely identical to building an activity feed. From the user’s perspective the functionality is pretty different. A notification system commonly shows activity related to your account. Whereas an activity stream shows activity by the people you follow. 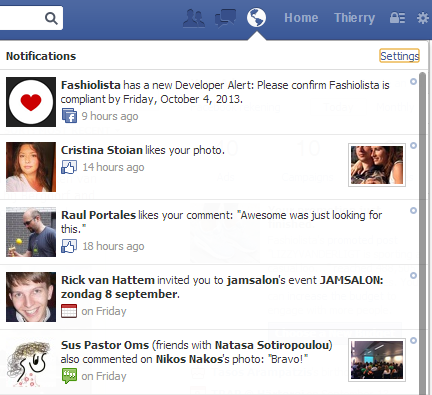 Examples of Fashiolista’s notification system and Facebook’s system are shown below. 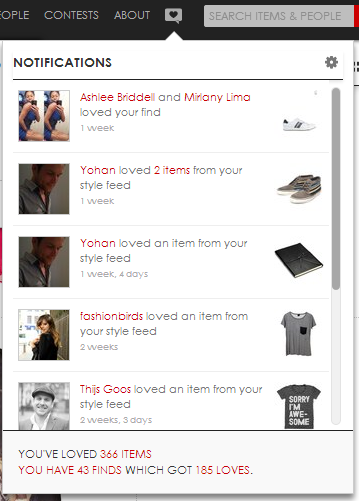 Fashiolista’s system is running on Stream Framework. It looks very different from an activity stream, but the technical implementation is almost identical. Only the Feed manager class is different since the notification system has no fanouts. Remember, Fanout is the process which pushes a little bit of data to all of your followers in many small and asynchronous tasks. For this tutorial we’ll show you how to customize and setup your own notification system. As a first step we’ll subclass NotificationFeed and customize the storage location and the aggregator. Secondly we want to customize how activities get grouped together. Most notification systems need to aggregate activities. In this case we’ll aggregate on verb and date. So the aggregations will show something like (thierry, peter and two other people liked your photo). To keep our code clean we’ll implement a very simple manager class to abstract away the above code.